Haswell allrounder. The Satellite L70-A-10T is another offer for those looking for a general-purpose laptop with 17.3 inch size. The customer gets a Haswell CPU, a GeForce graphics card, a big memory capacity and a full HD screen for about 900 Euro. 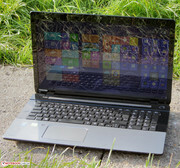 Our review reveals whether the offer from Toshiba is recommendable. 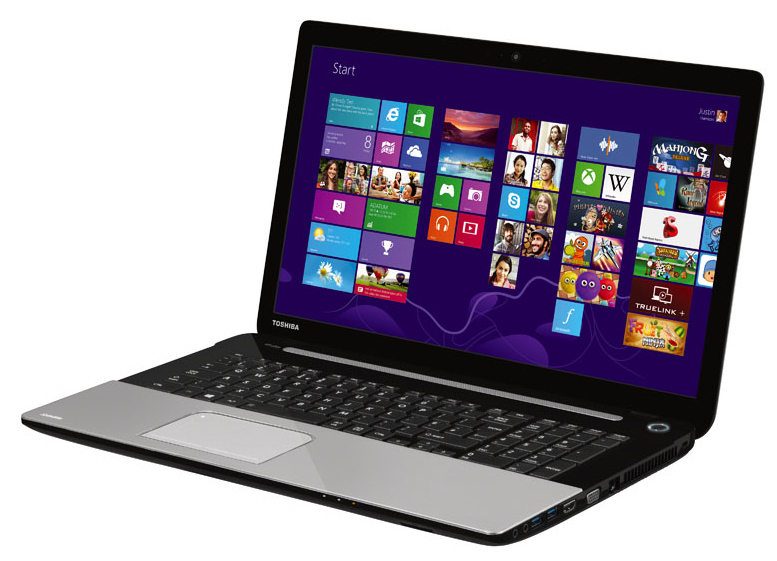 With the Satellite L70-A series, Toshiba offers a number of multimedia notebooks for the mainstream market. Our test model features a full HD display. The other components also meet our expectations: the models come with fast processors, gaming capable graphics chips and big storage capacities. 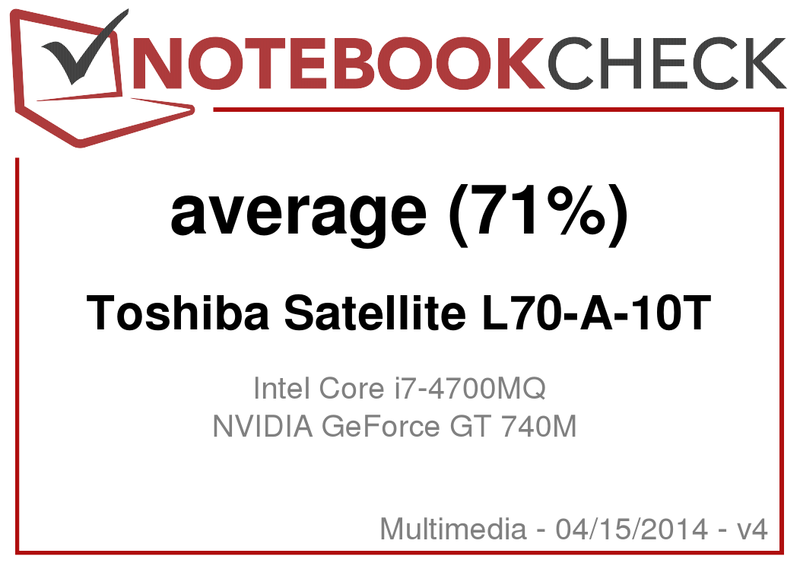 We already reviewed the identically equipped 15.6 inch Toshiba Satellite L50-A-10Q (Core i7-4700MQ, GeForce GT 740M). Our review reveals, whether the Satellite L70-A can also convince in practice. We compared the laptop to MSI's CX70-i740M281W7H (Core i7-4702MQ, GeForce GT 740M) and Acer's Aspire V3-772G (Core i7-4702MQ, GeForce GTX 760M). The case of the Satellite is completely made from plastics. Apart from the bottom tray and the keys, all surfaces are glossy. 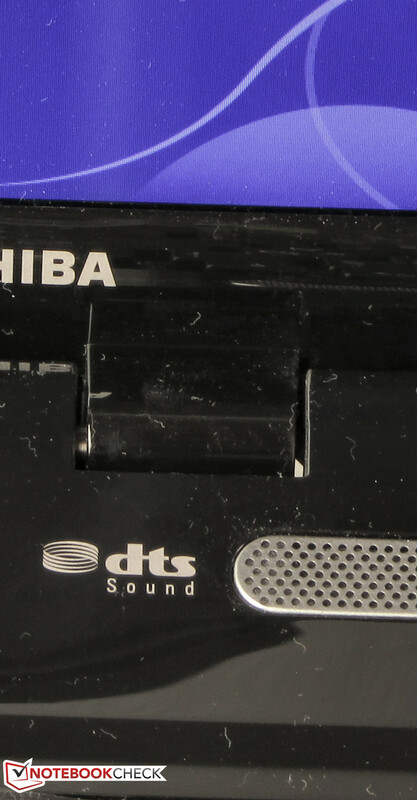 Toshiba uses two colors. 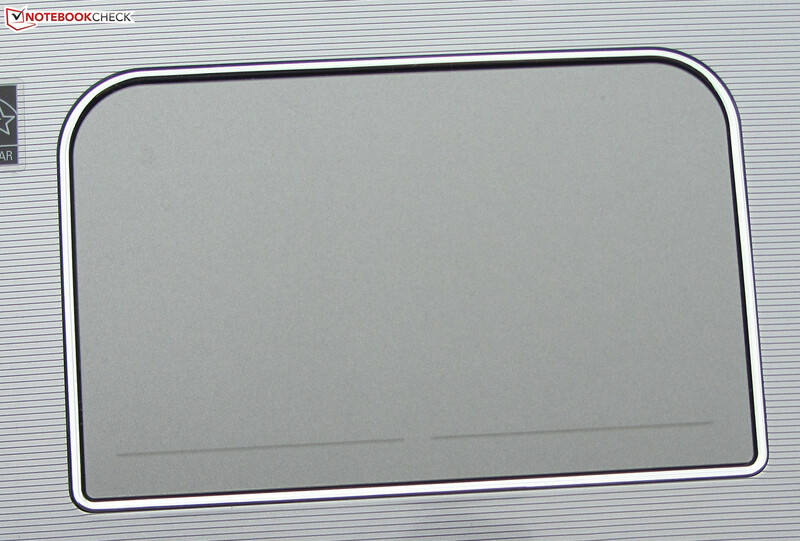 Palm rests and lid are silver gray with fine, dark gray lines, while the other parts of the case are black. If you appreciate high-end materials, you should consider the Satellite S70-A series. It has nearly the same design as the L70-A series, but the case features metal elements. The latter is also true for the Aspire V3-772G. Alike the Satellite L70-A the MSI is also completely made from plastics. The base unit is rather stable. Only the part in front of the touchpad can be slightly depressed when finger pressure is applied. The base unit slightly bends from side-to-side twisting. In contrast, the lid can be twisted too easily. But, the pressure resistance of the lid is better. You need to apply strong pressure to produce image distortions. The hinges hold the lid safely in place, but they also slightly wobble after adjusting the opening angle. It is possible to open the notebook with one hand. All three competitors are on par in connectivity and feature the interfaces usual today including two USB 3.0 ports. As a results copying files from an external hard drive was done quickly. The interface layout of the Satellite is not ideal. On the right side all slots are at the height of the palm rest. The left side houses the optical drive. If many ports are occupied, cables might be in the way of righties using a mouse. WLAN is provided by a Centrino Wireless-N 2230 from Intel supporting the 802.11 b/g/n standards. We ran into no connectivity issues or random drops during our time with the Satellite. The Windows Wifi status shows full connectivity in the vicinity of the router (3 m distance) and two floors away from it. The Gigabit Ethernet chip stems from Atheros (AR8161/8165). A Bluetooth 4.0 module is also built-in. Images from the web cam (2 MP) look muddy and have a maximum resolution of 1920 x 1080 pixels. Other than a quick start poster, a handbook about working securely and comfortably and information about limited warranty, no further accessories are included. 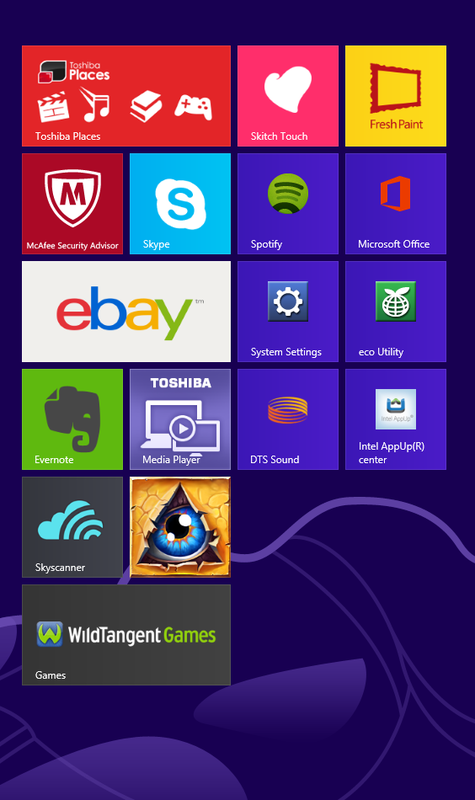 Windows 8 (64 Bit) is used as operating system. A Windows DVD is not included. 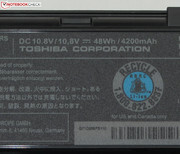 So, it is recommended to create recovery DVDs by means of the pre-installed Toshiba Recovery Media Creator. This would allow restoring the system after a hard drive swap. 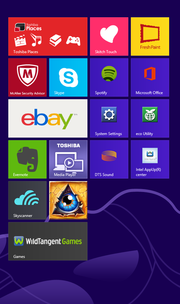 Windows 8 can be replaced by Windows 7 without problems if desired. 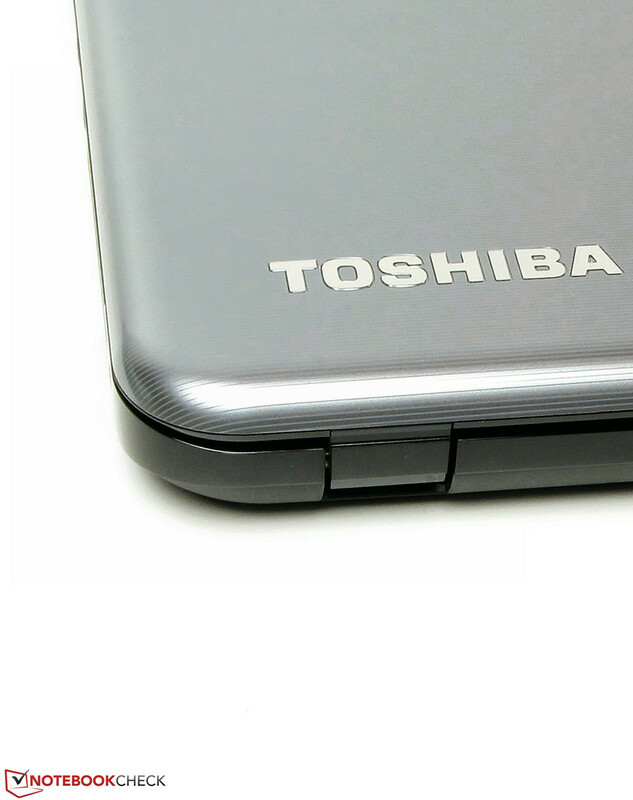 Toshiba provides drivers for both Windows versions. It is easy to get to RAM and hard drive. RAM and hard drive are hidden beneath the maintenance hatch. 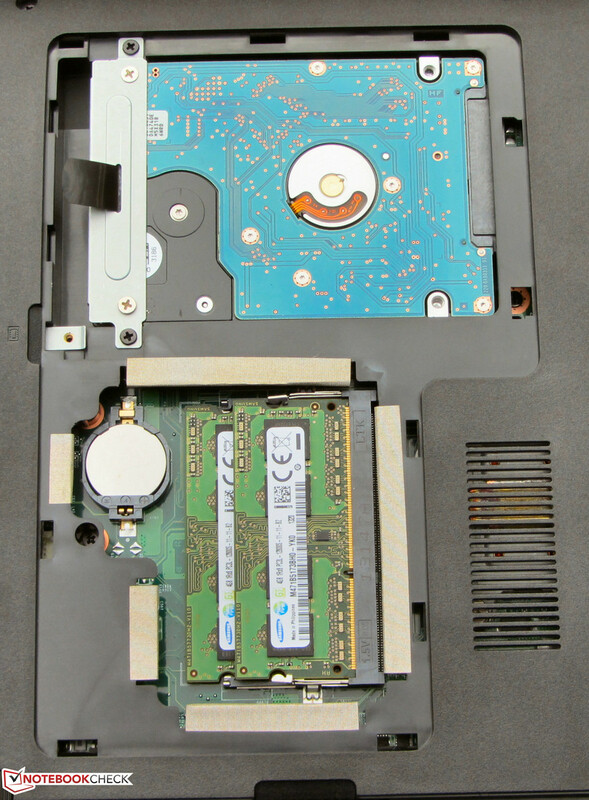 In order to get to the rest of the components, the laptop has to be dismantled. 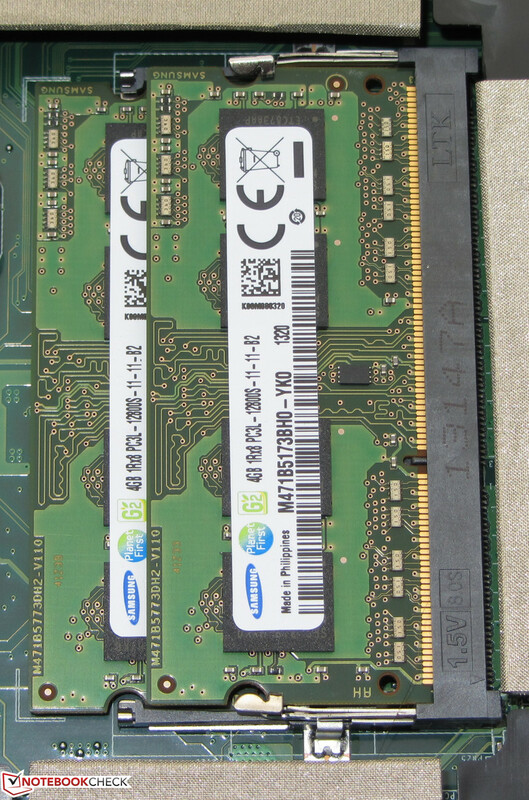 The Satellite features two RAM slots, which are both occupied by a 4 GB module enabling them to work in dual channel mode. 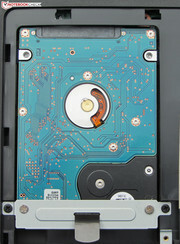 The hard drive could be quickly replaced. 2.5 inch hard drives with a height of 7 or 9.5 mm fit in the notebook. The Satellite includes a 12 month warranty - including pick-up service. If you register the laptop with Toshiba, the warranty can be extended to two years free of charge. The CX70 and the Aspire come with two years standard warranty. The warranty of the Satellite can be extended. E. g., three or four years on-site service cost 100 or 150 Euro, respectively. 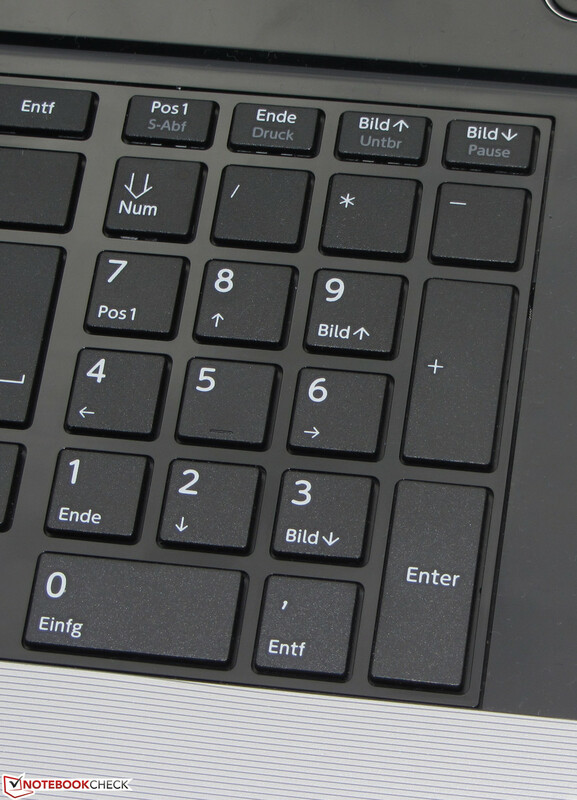 Toshiba equips the Satellite with a Chiclet keyboard without backlight. The main keys have an effective size of about 15 x 15 mm. The flat, roughened keys have a medium key travel and a clear pressure point. The key resistance could be slightly firmer. 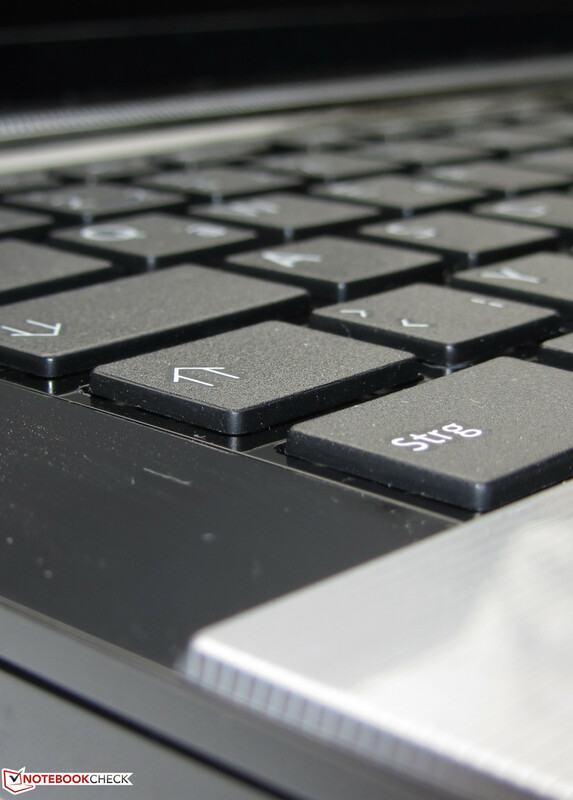 The keyboard bounces as you type; this is clearest in the middle of the keyboard. But, it not disturbing. We appreciate the indicator LEDs on caps lock key and num lock key. 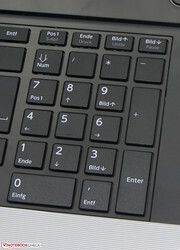 The clickpad has a size of 10.7 x 6.7 cm and supports multi-touch gestures. Its smooth surface and big size make using multi-touch gestures convenient. Each gesture can be separately enabled or disables in the settings. Not all of them are enable ex factory. A clickpad does not have separate mouse buttons as the whole pad is a button. The position of the finger determines, whether a left or a right click is triggered. 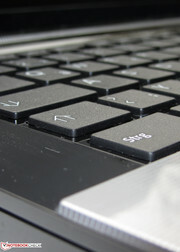 The clickpad has a short travel and a clearly audible and tactile feedback. The pad can be disabled by clicking the left upper corner. 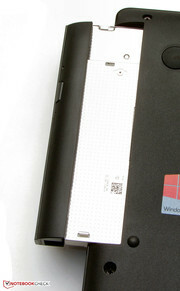 The integrated LED indicates whether the touchpad is active. The keyboard does not have a light. The touchpad supports multi-touch gestures. 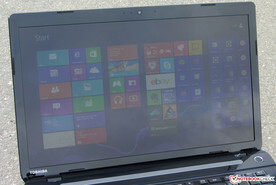 Toshiba equipped the Satellite with a glossy full HD display (1920 x 1080 pixels) with a size of 17.3 inch. The Aspire also comes with a full HD display, while the CX70 features a HD+ display (1600 x 900 pixels). The Satellite has a very good average brightness of 296.7 cd/m². The Aspire (293.7 cd/m²) is on par. The brightness of the MSI (238 cd/m²) is lower, yet still acceptable. Contrast (587:1) and black value (0.54 cd/m²) are not outstanding, yet good. The Aspire (837:1, 0.38 cd/m²) performs better, while the CX70 (301:1, 0.84 cd/m²) performs significantly worse than the competitors. The display can neither completely cover sRGB nor AdobeRGB, but it is close to sRGB. 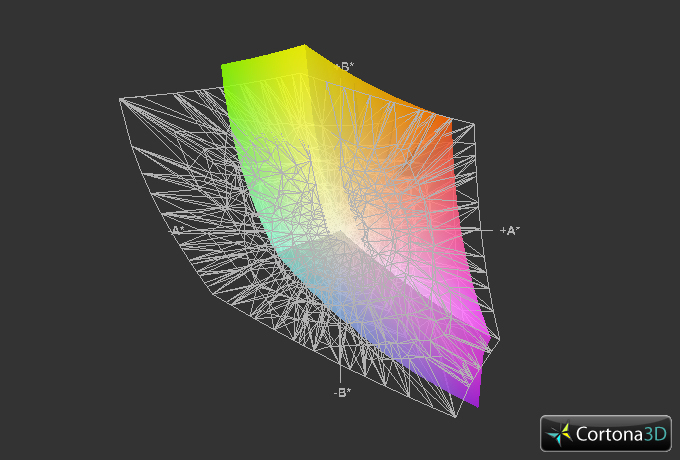 These color spaces are e. g. important for professional image editing. The average DeltaE-2000 deviation of the display is 10.52, which is exceeded in blue and gray levels. This explains why the display is bluish. Only green and yellow green reach the target range (DeltaE smaller than 5). Brightness and contrast are sufficient for outdoors. But, you should avoid very bright environments. In addition, you should make sure that the environment is not reflected by the highly reflective screen. 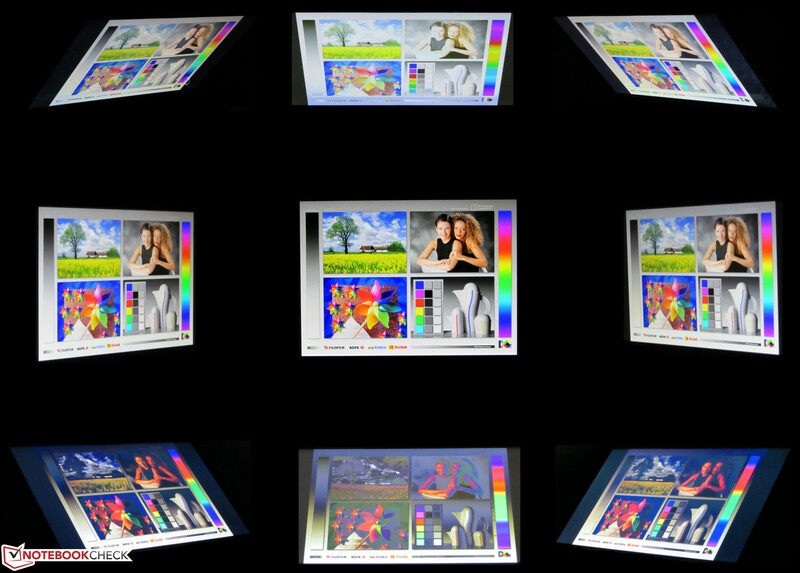 The viewing angles of the TN LED display are significantly wider than most cheap displays'. When viewed from above, the image is still largely readable. The image is only slightly distorted. The distortions are slightly bigger when viewed from below. Moving in horizontal direction does not pose a problem. You can also read the image from the sides, but the image gets darker when the angle increases. 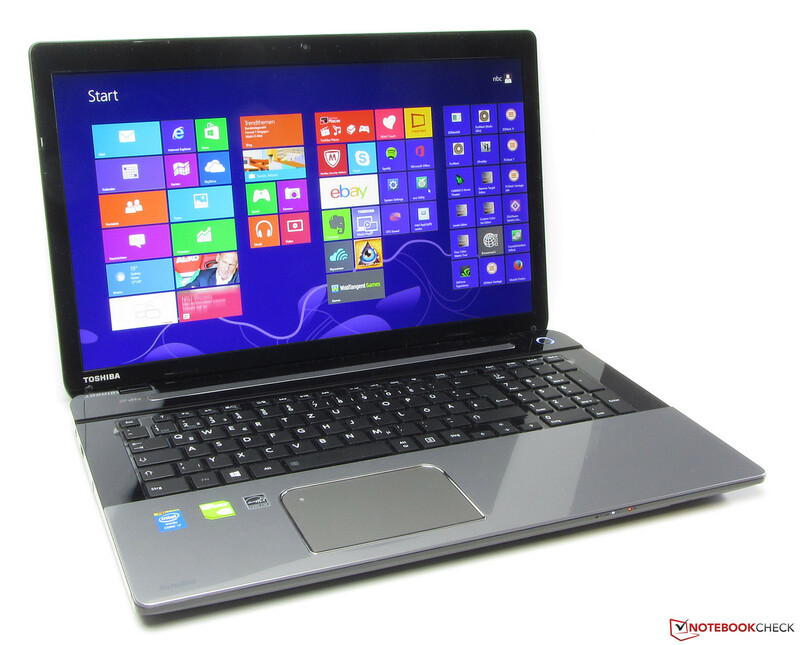 With the L70-A-10T Toshiba offers a mid-priced general-purpose 17.3 inch laptop. The computer can run current computer games and its performance is e. g. sufficient for video editing and certainly also low demanding tasks like office, Skype, and watching videos. Our test model currently costs 900 Euro. At the time of testing, two further models of the L70-A series, which both feature an Core i5-3230M processor, were available. The remaining differences to our test model are quickly identified: The L70-A-11Q (about 800 Euro) comes with a 1 TB hard drive, while the L70-A-11M (about 700 Euro) features a 500 GB hard drive and an HD+ display (1600 x 900 pixels). 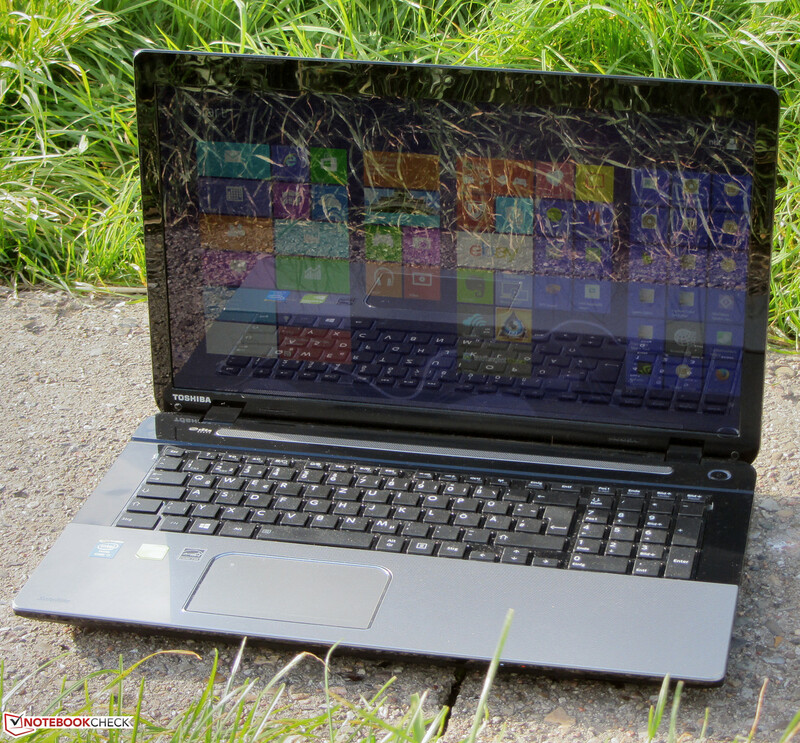 The Satellite is powered by a quad core Intel Core i7-4700MQ processor of the Haswell generation. 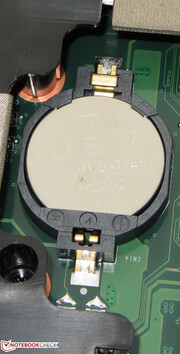 It features a base clock of 2.4 GHz. Thanks to its Turbo technology, the clock rate can be increased to 3.2 GHz (four cores), 3.3 GHz (2 cores) and 3.4 GHz (only one core). The CPU should for example be about 10% faster than its Ivy Bridge predecessor, the Core i7-3630QM. According to Intel, the TDP of the processor is 47 Watt and so 2 Watt higher than the predecessor's. 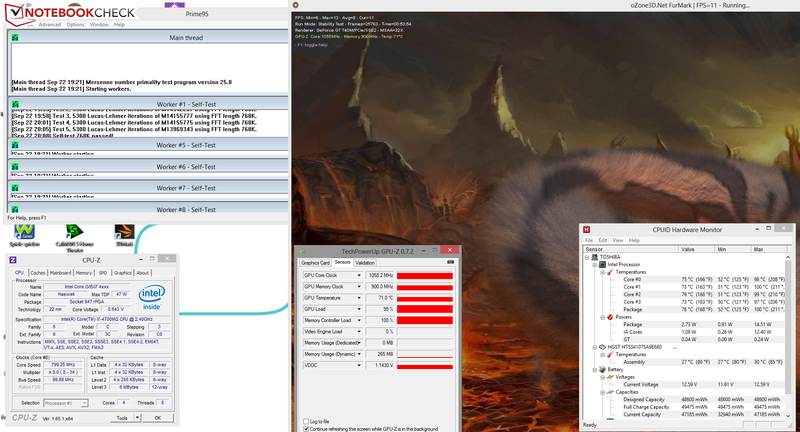 During the single thread tests of Cinebench, the processors clocks between 3.2 to 3.3 GHz, while the clock rate of all four cores is 3.2 GHz in the multi threading tests. So, the results are as expected. As the Satellite is equipped with the fastest CPU, it performs best. But, the Aspire (Core i7-4702MQ, GeForce GTX 760M) and the CX70 (Core i7-4702MQ, GeForce GT 740M) are only slightly slower than the Toshiba. However, Aspire takes the lead in the GL test of Cinebench R11.5, as it features the fastest graphics card. In general, the system works smoothly. But, it cannot break performance records, because of its only moderately fast hard drive. We would have expected it to use an SSD cache, which supports the hard drive, at least. Nevertheless, the results of the PC Mark tests are very good. The CX70 performs significantly worse than the Toshiba (Core i7-4702MQ, GeForce GT 740M). 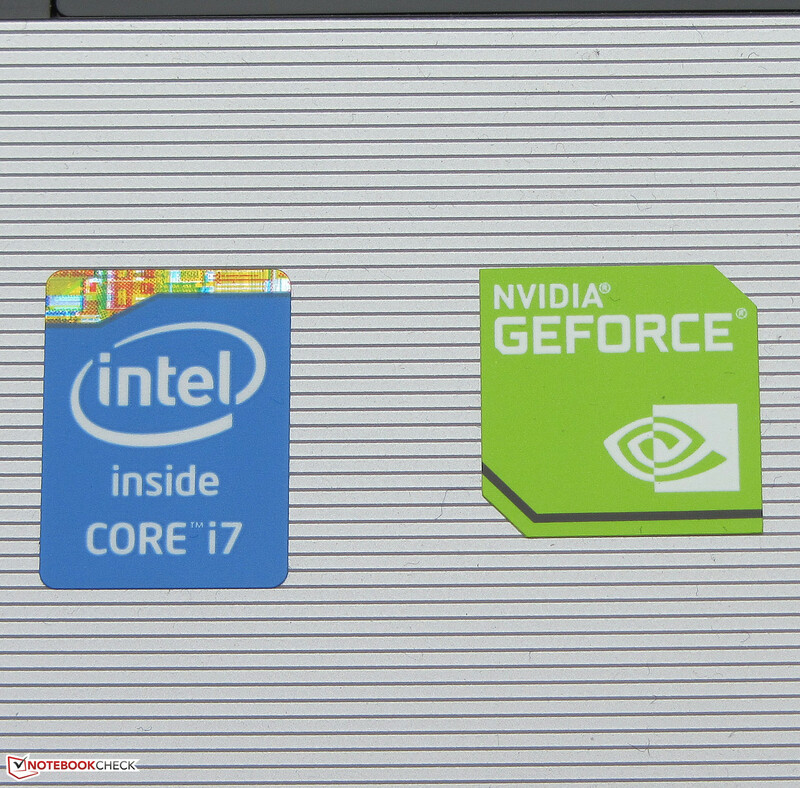 The Aspire (Core i7-4702MQ, GeForce GTX 760M) takes the lead as it is equipped with a fast SSD. A general purpose computer like the Satellite indeed requires an SSD. We put one (Crucial RealSSD C300 - 64 GB) in our test model and installed Windows 8 on it. The system boots significantly faster and applications start quicker. In addition, the results of the PCMark benchmarks vastly increased. The PCark 7 rose by about 69 percent to 5572 points, the PCMark Vantage result increased by 130 percent to 18241 points. Our test model comes with a Travelstar 5K1000 series hard drive from HGST with a capacity of 750 GB and a revolution speed of 5400 rpm. The benchmark results are a mixed bag. CrystalDiskMark reports a sequential read rate of 86.98 MB/s, while HD Tune displays an average transfer rate of 66.5 MB/s. Both are poor values for a 5400 rpm hard drive in 2013. But, the access time of 16.4 ms is good and the results of the 4k read and write tests are above average for a conventional hard drive. Many comparable hard drives perform worse. The 4k read and write rates are important, because most data is stored blocks of 4 kb size. The Satellite features a HD Graphics 4600 graphics core from Intel and Nvidia's GeForce GT 740M GPU. The GeForce graphics chip is used during demanding tasks, while Intel's GPU is used for everyday tasks and on battery. Both GPUs support DirectX 11.1. The GeForce is a mid-range graphics card and its base clock is 980 MHz. The Turbo can increase the clock rate to a maximum of 1058 MHz. The Satellite indeed uses the Turbo. 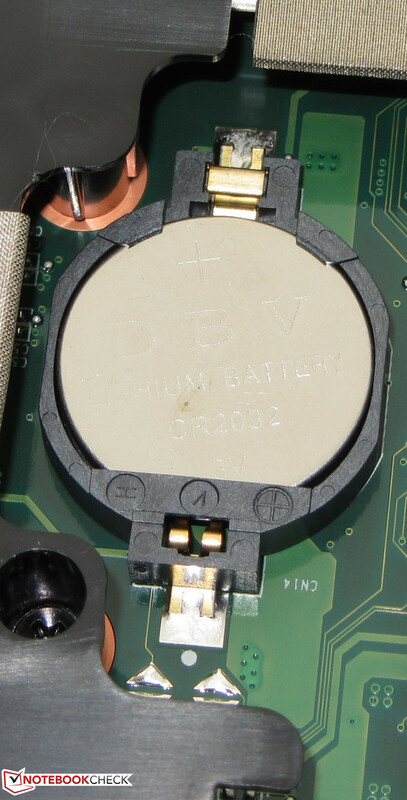 Unfortunately, the GeForce chip cannot use its full potential, because the connection to the video memory is only 64 Bit. The same is true for the MSI CX70. The Satellite and the CX70 (Core i7-4702MQ, GeForce GT 740M) use the same GPU and achieve about the same results. The results of both computers are within the GPU's usual performance range. As the Aspire (Core i7-4702MQ, GeForce GTX 760M) has a significantly faster graphics core, it delivers the best results. 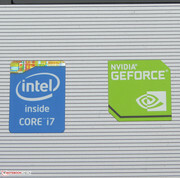 Core i7 processor and GeForce GPU allow to smoothly play current computer games in HD resolution (1366 x 768 pixels) with medium graphics quality. Several relatively undemanding games should also run smoothly with high quality settings. As already mentioned above, the Satellite cannot use its full potential, as the video memory only has a 64 bit connection. In addition, the CPU clock rate fluctuates if the GPU is used simultaneously, which partly decreases the results. E. g. the frame rate of the Satellite is about 11 lower than the very similarly equipped CX70's in Anno 2070. If gaming capability is important, the Aspire V3-772G is the better choice. It delivers significantly higher frame rates and games often run in full HD. Currently, the model we reviewed costs about 1500 Euro. If you are not satisfied with a conventional 1 TB hard drive and 8 GB RAM, the computer is already available for 999 Euro. If you also spare the Windows OS and the GeForce GTX 760M GPU (GeForce GT 750M is used instead), the Aspire is already available for about 830 Euro. We measured a noise between 32.1 and 32.2 dB while idle. These values are alright. The Aspire (31.7 to 33.4 dB) is about on par, the CX70 (33.1 to 33.4 dB) is slightly louder. Under medium (3D Mark 06) and full load (stress test: Prime95 and Furmark) the noise of the Satellite only increases to moderate 32.5 and 36.6 dB, respectively. The Aspire (39.4 and 40.6 dB) and especially the CX70 (38.3 and 44.4 dB) are significantly louder. The Satellite L70-A-10T during the stress test. The surface temperatures of the Satellite are very low while idle. The values of the Aspire and CX70 are slightly higher, yet still alright. The temperatures of the Toshiba only moderately increase under load. 50 °C are only exceeded below the fan. On average the competitors get warmer. The processor cores run with a clock rate between 2.8 to 3.2 GHz during the stress test on mains. Again and again, the clock rates of all four cores suddenly fall to 800 MHz. This happens as soon as the processor reaches a temperature of 100 degrees Celsius and it quickly reaches this level, when the cores run with the clock rates mentioned above. The same is true for battery mode. However, the CPU only reaches clock rates between 2.8 to 2.9 GHz here. So, it takes longer until the 100 degrees Celsius level is reached. The graphics core always runs at its full Turbo clock (1058 MHz) in mains operation and on battery. We reran the 3D Mark 2006 benchmark immediately after the stress test and the Toshiba only achieved about half the result with 5545 points. So, performance drops in games with simultaneous high CPU and GPU load cannot be excluded. The hardware is indeed slightly slower than potentially possible in the tested games. (±) The average temperature for the upper side under maximal load is 32.2 °C / 90 F, compared to the average of 30.9 °C / 88 F for the devices in the class Multimedia. (±) The maximum temperature on the upper side is 41.3 °C / 106 F, compared to the average of 36.5 °C / 98 F, ranging from 21.1 to 71 °C for the class Multimedia. (+) In idle usage, the average temperature for the upper side is 24.9 °C / 77 F, compared to the device average of 30.9 °C / 88 F.
(±) The palmrests and touchpad can get very hot to the touch with a maximum of 36.4 °C / 97.5 F.
(-) The average temperature of the palmrest area of similar devices was 29.1 °C / 84.4 F (-7.3 °C / -13.1 F). The stereo speakers are above the keyboard beneath a perforated grille. Their sound is rich, but it lacks bass. If you place value on a better sound experience, you should use external speakers or headphones. We measured a power consumption of 5.5 to 15 Watt while idle, which is alright for the hardware. The Aspire (7.8 to 16.4 Watt) and the CX70 (10 to 16 Watt) demand slightly more energy. Under medium load (3D Mark 06) and full load (stress test: Prime95 and Furmark) the power consumption of the Satellite is only 38.3 and 50 Watt, respectively. These values are significantly lower as the CX70's (63.2 and 81.5 Watt) with nearly identical components. It gets apparent here that the Satellite cannot use its CPU Turbo completely and permanently, while GPU load is high. The energy consumption of the Aspire (82.4 and 85.6 Watt) is also relatively low under full load, as its CPU is also not used to capacity in this scenario. While idle the Satellite achieves a battery runtime of 8:02 h, which is significantly longer than the Aspire's (5:46 h) and the MSI CX70's (6:49 h). The idle runtime was recorded by the Battery Eater Reader's test with minimum display brightness, energy saving profile and disabled radio modules. Under load the Satellite runs 0:43 h on a single charge. In this scenario, the CX70 (0:56 h) and the Aspire (1:11 h) achieve slightly longer battery runtimes. The load scenario is tested with the Battery Eater Classic test with maximum display brightness, profile "maximum performance" and enabled radio modules. The WLAN test keeps running for 3:30 h on a single charge. The battery life of the Aspire (3:23 h) and CX70 (3:48 h) only slightly differ from the Satellite's. In this test a script automatically loads web sites every 40 seconds, the energy saving profile is active and the display brightness is set to about 150 cd/m². DVD playback ends after 2:29 h on the Satellite. The CX70 (2:50 h) and the Aspire (2:44 h) perform slightly better. The DVD test is run with energy saving profile (or higher, if the DVD does not play smoothly), maximum display brightness, and disabled radio modules. 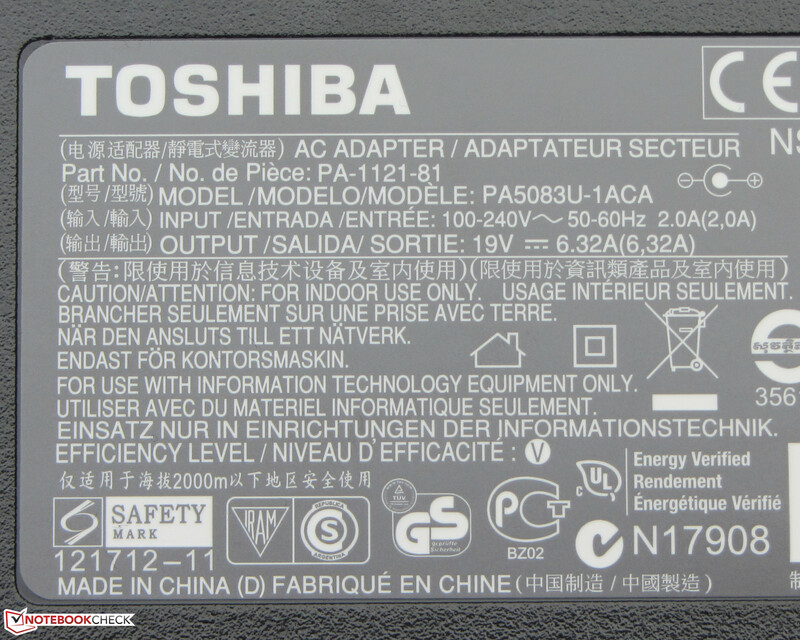 The battery life of the three devices can be easily compared, as they have similar battery capacities (Toshiba and Acer: 48 Wh, MSI: 49 Wh). 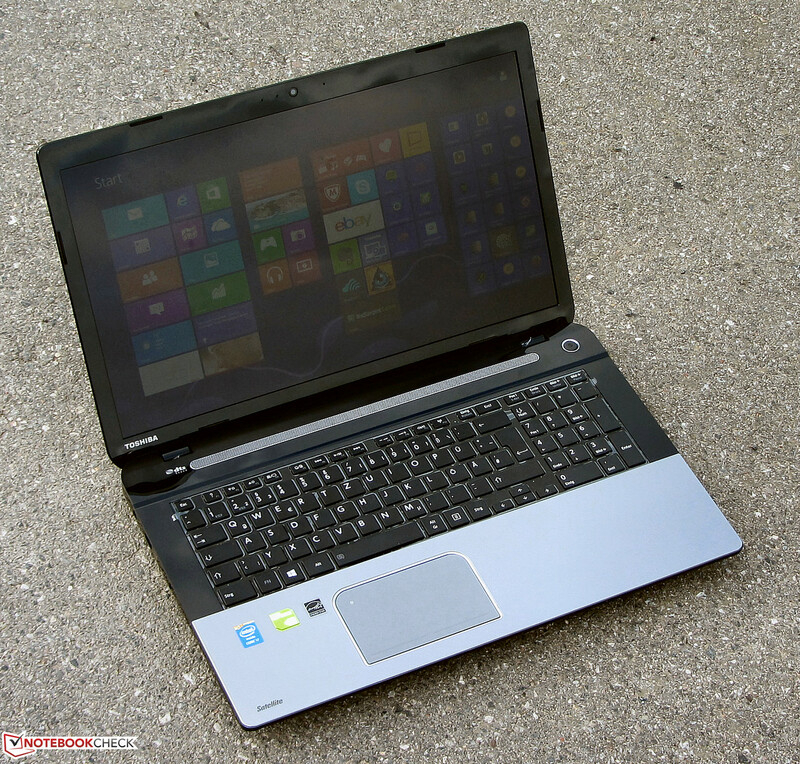 The Toshiba Satellite L70-A-10T delivers a very good system performance and an acceptable gaming performance. In addition, it comes with a big storage capacity. The notebook works relatively quietly and its power consumption is comparatively low under load because of temporary CPU throttling. The display belongs to the better TN LED models. Its brightness is good, but it is bluish. The Acer Aspire V3-772G is better for users demanding more gaming performance. The MSI CX70-i740M281W7H is attractive for users attaching importance to a matte display. In addition, the CX70's maintainability is better. Its processor could be easily replaced. The DVD burner reads and writes any kind of DVD and CD. A number pad is available. ...hold the lid safely in place. 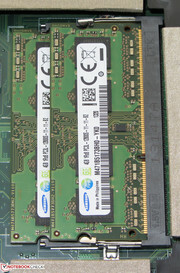 Two RAM slots are available. 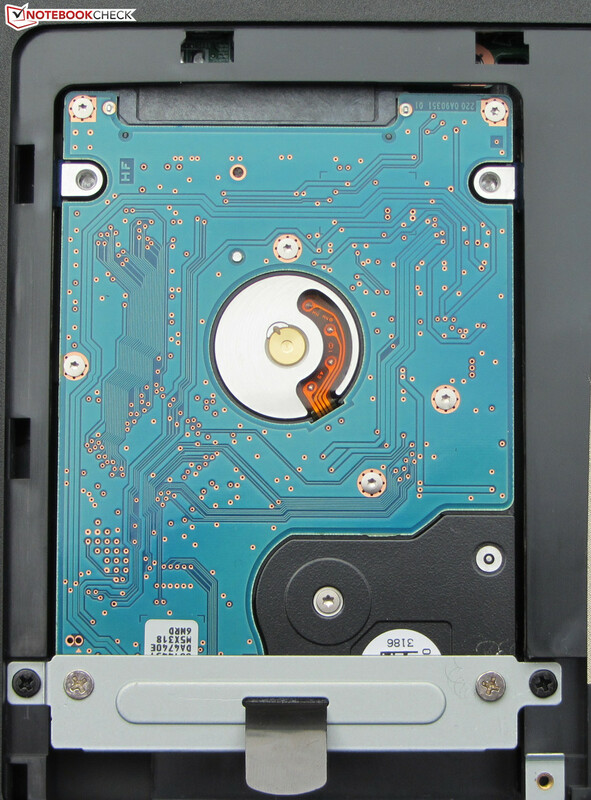 It is easy to replace the hard drive. You can get to the BIOS battery. 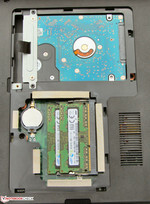 The DVD burner can be replaced. ...and delivers a maximum of 120 Watt. ...and has a capacity of 48 Wh. The key travel is medium. The speakers are above the keyboard. The performance of the notebook is high. The power button is surrounded by an illuminated ring. 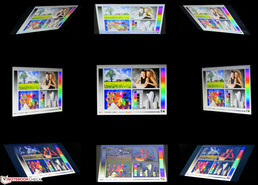 Recovery DVDs can be created with the Recovery Media Creator. The Health Monitor shows whether the notebook works flawlessly. 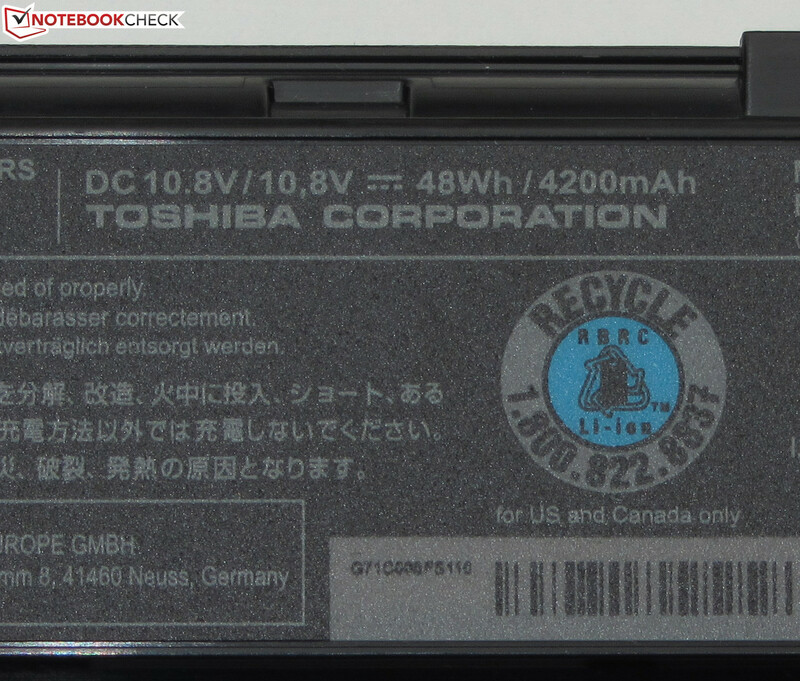 If you register the notebook with Toshiba, you can extend the warranty to two years. the decent system performance and the bright full HD display. a faster hard drive or an SSD cache would be great. 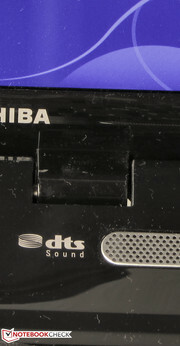 Toshiba only connects the video memory via 64 bit interface, which slightly decreases the graphics performance. We expected more from a 900 Euro notebook.